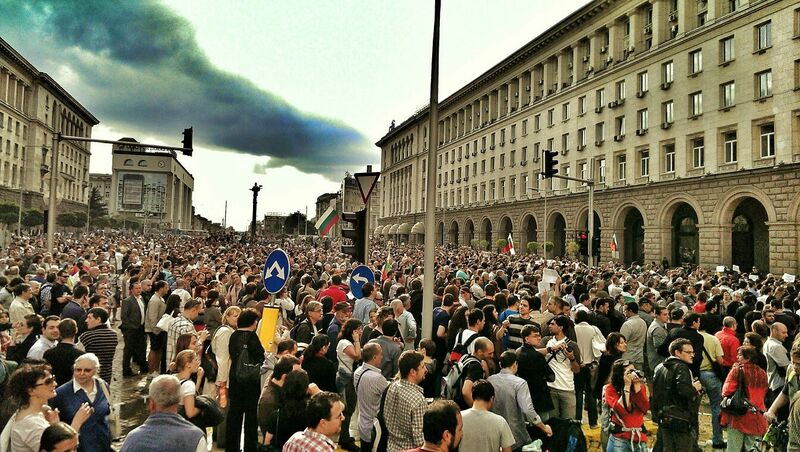 EVERY day, for the last twelve days, at exactly 6:30pm, Independence Square, a busy intersection in the center of Sofia, has been the starting point for a protest march that passes by the parliament building, the so-called Eagle’s bridge and the National Palace of Culture. Around 10,000 people participate every evening. They are calling for more transparency, less corruption and an end of the local oligarchs’ rule. “My trust in this government is gone after this appointment,” said Rosen Plevneliev, the president, who questioned Mr Peevski’s “reputation and competence”. As the protests gathered speed, Mr Oresharski admitted the appointment was a mistake and parliament reversed the decision. But the U-turn failed to appease the protesters. They are now demanding the resignation of the whole government as well as changes in the electoral law to allow smaller parties to enter parliament. Unlike the demonstrations earlier this year, the current rallies are largely peaceful. More and more members of the middle class are joining the protests, including popular actors, writers and musicians as well as families with babies and strollers. “We feel that nobody is steering the boat,” says Mihail Vuzharov, one of the protestors who is a marketing specialist at a medical IT startup. “In fact, the boat has been sinking for decades.” Therefore, adds Justine Toms, a business-development manager in Sofia, “we are protesting against the people who should be in jail and are instead appointed at high posts in the state.” Most Bulgarians tend to agree with Mr Vuzharov and Ms Toms: over 80% say they support the protests, according to a poll by Alpha research. Today sixty prominent intellectuals, lawyers, journalists and human rights activists posted online a “charter for disbanding the plutocratic model of the Bulgarian state” calling for genuine democracy and the rule of law . The wide backing by Bulgaria’s society (the educated elite in particular) makes the situation extremely tough for the government according to Tihomir Bezlov, political analyst with the Center for the Study of Democracy in Sofia. Most analysts agree that it won’t be able to serve its full four year term. In fact, the odds were against the government of Mr Oresharski from the very beginning. The Socialist party was able to form a cabinet only because GERB, the ex-ruling party of Boiko Borisov which won the May 12th snap elections, was unable to muster a parliamentary majority. With only half of the votes in parliament, the Socialists and their partners from DPS were left reliant on the unpredictable, ultra-nationalist Ataka party. BBC News: Opposition MPs in the Bulgarian parliament have protested after a media tycoon was appointed to head the national security agency. Delyan Peevski, 32, a member of the country’s Turkish minority party, was voted into the post without a debate by the ruling Socialists and their allies. He had been nominated by the new Prime Minister, Plamen Oresharski. President Rosen Plevneliev demanded a review of the vote, questioning Mr Peevski’s “reputation and competence” as a crowd of thousand protesters gathered outside parliament in the capital, Sofia. Mr Peevski joined a Socialist-led government in 2005 as deputy emergency response minister but was sacked two years later and investigated over corruption allegations. The investigation was later dropped. The Socialists have been governing in a fragile minority government as a result of last month’s general election, which followed unrest over the country’s economic crisis. External specialist: Mr Oresharski has defended the appointment of Mr Peevski, saying Bulgaria needs to take serious steps to stop organised crime and smuggling and he is best suited for the job, despite lacking experience. “Peevski was chosen because he is not part of the system and we deliberately looked for such an external specialist so that he can restructure it,” he told reporters. However, the speed of the appointment has raised questions. British Ambassador Jonathan Allen wrote on Twitter: “The appointment has been rushed through with no hearings, debate or opportunity to find out about candidate. Why?” President Plevneliev, from the Gerb party which lost the election, said the decision would have “longstanding negative consequences for Bulgaria”.